Carrying prescription drugs and certain other medications without having a valid prescription is becoming more and more common. Prescription medication can have very powerful and addictive effects on anyone who takes it. With drugs such as OxyContin, Percocet, Vicodin and Ritalin becoming more readily available, the scary reality is that teenagers are now using these drugs illegally and studies have shown that the use of illegal drugs by teens has gone down significantly while the abuse of teens using prescription drugs is on the rise. Under N.J.S.A. 2C:35-10.5, New Jersey’s Prescription Drug Statute states that it is illegal to carry prescription drugs and other medications without a valid prescription. Also possessing and distributing prescription medication is illegal unless you are a licensed physician, pharmacist, dentist or other practitioner that is authorized by law to prescribe or distribute prescription drugs. What Is The Penalty For Violating New Jersey’s Prescription Drug Statute? If you are found to have knowingly or constructively possessed a prescription drug without a valid prescription in the amount of four or fewer dosage units, than you will be charged with a disorderly persons offense in New Jersey (equivalent to a misdemeanor crime). Constructive possession is any situation where an individual does not have the prescription medication on them physically but has actual control over the prescription drugs. For example, if the prescription medication is found in your car after a police officer has stopped your car and conducted a search you could be possibly charged with constructive possession if you are the owner of the vehicle. If an officer finds that you contained the same amount of drugs and had intentions on distributing it then you can be charged with a fourth degree crime in New Jersey. Fourth degree offenses generally lead to 18 months in prison and fines up to $10,000. It is important that you contact an experienced defense attorney to help you fight the charges. If you are a first time offender charged with a 4th degree crime, you may be eligible for pretrial intervention, in which the charges can be dismissed if you successfully complete a period of temporary probation. 3rd Degree offense involves a quantity of at least five but fewer than 100 units and intent to distribute. Fines range up to $200,000 and a prison sentence of 3-5 years. 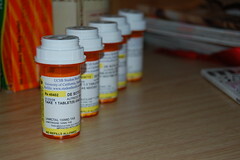 2nd Degree offense involves a quantity of 100 prescription pills or more with intent to distribute. Fines range up to $300,000 and a prison sentence of 5-10 years can be imposed. Can I Be Charged With A Crime If I Keep My Prescription Pills In Another Bottle? Under N.J.S.A. § 2C:35-24, you can in fact be charged with a disorderly persons offense in New Jersey if you don’t keep prescription medication within the original container. The only caveat is that if you have no more than a ten day supply of the medication and you are able to provide a police officer the name and address of the pharmacist or doctor that prescribed you the medication. Violating this statute will result in a disorderly persons offense, a permanent criminal record, up to $1,000.00 in fines and six months in county jail. What If I Obtain A Prescription By Forging A Prescription? If you acquire prescription drugs through any type of fraud it is considered a third degree crime in New Jersey under N.J.S.A. 2C:35-13. The penalties for committing such an offense are severe including a fine of up to $50,000 and 3-5 years in prison, and your license can be suspended for a minimum of 6 months. In addition to that you can also be charged and prosecuted for a theft crime. Should I Consult a Defense Attorney if I Buy or Sell Prescription Drugs Online? As noted above the crimes and penalties associated with prescription drugs are severe. Contacting an experienced criminal defense attorney that handles prescription drug crimes can make the difference in the results of your case. If you or a loved one has been charged with the illegal use and/or distribution of prescription drugs, have forged prescriptions or obtained a prescription through fraud or misrepresentation then call The Rosenblum Law Firm today.